A State Trooper, Triple Homicide, and a Search for Justice. On September 28, 2000, former Indiana State Trooper David Camm made a frantic call to his former colleagues in the state troopers office: He’d just walked into his garage, and found lying on the floor the bodies of his 35-year-old wife, Kim, and their two children, Brad and Jill, ages 7 and 5. This was the kind of crime that could tear the heart out of a community. The Camm’s lived the American Dream. They had what seemed like a loving marriage, a nice little house with a white picket fence, and two adorable children. To top it all off, David Camm was a pillar of the community who had dedicated his career to the enforcement of the law and the sanctity of human life. Then, this happened. Three days later, it got worse when police arrested David Camm for the triple murder. Soon, new stories started emerging: stories about mistresses and violent bursts of temper. And as the ugly truth about the Camms’ marriage got uglier and the evidence against David started piling up, two families-and the community at large-took positions at opposite sides of a yawning and bitter divide. Was David Camm a dedicated, conscientious public servant-the victim of unspeakable tragedy, railroaded by an unfair system? Or was he a cold-hearted murderer who earned his three murder convictions and every one of the 195 years behind bars to which he was sentenced? 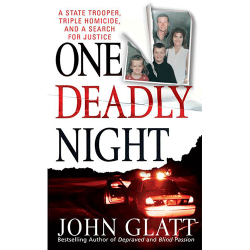 Investigative journalist John Glatt finds out in this gripping new book. John Glatt © 2019. All Rights Reserved.